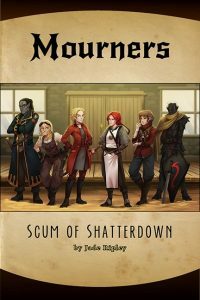 And now for something completely different: “Mourners: The Scum of Shatterdown” would be Dreamscarred Press’ and author Jade Ripley’s first foray into the realms of fantasy fiction; structure-wise, it is a 156 page novella, but frankly, its plot could have fitted the pages of a significantly larger-sized book. The pace of the narrative is, ultimately, one that is quick and does not waste your time. I will try to refrain from resorting to spoilers in this review, since it is my firm believe that just summing up the plot of a novel is, ultimately a futile exercise that benefits no one. If you’re looking for long, drawn-out descriptions of even the minutest detail, then this will, by virtue of its scope, quite probably not satisfy you. That being said, there is an obvious target demographic for this, and it would, at least partially, be roleplayers: You see, this book’s general magic and system is based on Pathfinder/D&D, which means that those with the respective background will actually recognize several aspects featured herein. This does lend a basic underlying cohesion and coherence to the rules that govern the world, which, among other things does a good job in keeping the threat-level alive and proofs the book against the Mary Sue-syndrome that so many fantasy novels suffer from, so that’s a plus in my book. Whether or not you’re a roleplayer, though, chances are that you may have read a couple of fantasy books that did draw upon a roleplaying world’s canon – and therein lie two significant dangers one should not underestimate from a structural point: Number 1, relevant for those that do not care about roleplaying or accurate depictions of “their” system, would be that frankly, round-based based combat and vancian spellcasting do not translate themselves too well into the realm of fiction; they can bog down the plot and action and end up detracting from the plot at hand. Number 2 would be that authors kinda want to use the canon, but then, in order o make their plot work, break the system’s assumptions. If you need a good example: There is frankly nothing that makes me put a way a fantasy novel faster than the burned-out mage who suddenly can cast because he *really* wants to and its convenient to the plot. Similarly, radical power-escalations from one second to the other have a habit of annoying me. Mourners: Scum of Shatterdown manages to avoid both of these traps. It retains a sense of “realism” within the confines of the established rules and allows those who know the game to enjoy “getting” the nudges and winks, without requiring these to enjoy the novella. So yeah, if you’re like me and have stopped reading fantasy books based on RPG-systems…you may actually like this one. Now let’s talk a bit about the plot, shall we? There would basically be two main protagonists, first of which would be Anastasia Luxan, unintentionally in service to an order of paladins as a kind of liaison to the self-styled Scarlet Princess Aisling Moonheart. The action takes place in the city of Shatterdown…I could expand upon the characters, but in order to avoid spoiling the plot, let’s instead talk about the language and leitmotifs employed…it’ll help you determine better whether this is for you. Well, for one, this novella pretty much is one that mirrors a duality in language: It is, for example, pretty evident that language is relatively modern, including swearing. If you expect quasi-medieval dialogue or flowery prose, then this will not deliver what you were looking for. However, the author does something pretty intriguing with the language, namely underline another leitmotif: This book, to a certain degree, is a story of identity and freedom. The agents of the authorities and any entities you’d describe as hierarchical representations of the in-game’s mainstream society tend to choose their words, at least in public contexts, pretty carefully, whereas the misfits, the scum of shatterdown, tend to engage in a more profanity-heavy type of discourse. This, however, does not pertain the moral fiber of said misfits; in fact, the restrictive regular society with its individuality stifling rules can easily be read as a scathing commentary on the hypocrisy of our modern-day PC-culture: While refined to an outside observer (like the reader), there is an underlying theme of restrictions and limitations upon one’s own identity that double as a kind of indirect force to impose a premade world-view upon the characters. In stark contrast to this, we can find freedom and the option for self-expression within the fringes of society, among the people deemed to be the “scum” of the city. In fact, the very title of this book, ultimately, is an ironic sentiment, for it is said scum that represents the finest you can find, as mirrored in a quasi-Arthurian scene. It is with rare compassion and without even a shred of sentimentality, a rare combination in my experience, that author Jade Ripley manages to tackle several aspects of coming to terms with one’s own identity: Within the somewhat anarchic shadows cast by the rigid aspects of society, the question of identity in relation to one’s parents or creators (that’ll make sense when you read the book) and the relation of identity in regards to one’s own gender/sexual identity can be found. Which brings me to another aspect: While I wouldn’t call this fantasy punk or mythpunk or anything like that, it is very much 21st century neo-fantasy that does not shirk away from the depiction of queer characters. Indeed, perhaps the most striking achievement of this novel, to me, would be that it manages to describe characters and their struggles with coming to terms with their own identity without resorting to endless introspection, angst and self-pity; if a character comes to term with one of the identity-constituting questions herein, it is as much part and consequence of the heroic struggle as the more visceral conflicts. In short: This is not a whining woe-is-me pity-party for anyone; it is the chronicles of people that have, by various circumstances, moved into the fringes of subculture and society, to find their own moral integrity and identity and standing up for those. Indeed, the lack of sentimentality in the novella is profound: We do not engage in any sort of glorification of the aforementioned identity-construing elements. While ultimately, the characters are misfits, this novella does not necessarily condemn; it does not preach and show a heavy-handed moral about discriminating the marginalized down one’s throat. Instead, Mourners: The Scum of Shatterdown manages to achieve a feat (little in-joke for the roleplayers) only rarely seen: It normalizes the identity-constituting elements that ended up stigmatizing the characters; these components do not, on their own, make up the identity of the characters. Instead, they are organic aspects of the overall depictions featured for them; they are part of the characters, crucial parts, yes – but they do not overlap the identities, they do not become the central and all-defining aspect and ultimately, the message is clear: If you are an upright being, it doesn’t matter who you are, what kind of sexuality you have, how you came to be the way you are; what you do, how you act, being true to yourself – those are what matters, not whether you can eloquently skirt around the nasty 4-letter words. It also represents a glimmer of hope to those that feel ostracized and is pretty much a narrative of finding one’s place, of establishing a kind of rapport and tribe with whom one can relate. There are people out there that can respect you for what you are. In short: This is the most non-soppy, unsentimental “It gets better” I have read in a long, long while and as such, makes for an actually uplifting reading experience. Now I wouldn’t be me if I didn’t have something to complain about, though frankly, in this case, it is a minor complaint: To me, the pacing has felt a tad bit too breakneck at times: The book manages to cram a surprising amount of plot into its pages and personally, I think some scenes that linger a bit more, that leave a little more breathing space for character development, wouldn’t have hurt. This notwithstanding, I was more entertained by Mourners than by the vast majority of fantasy books I have read in the last two years. I usually gravitate towards high concepts and flowery prose and I am usually one of the guys who can read a sentence multiple times and appreciate the sheer beauty of it. Either that or Miévillian New Weird, horror or the like. Most traditional fantasy books tend to bore me with cardboard cutout characters. In short: I did not expect to enjoy this book to the extent that I ultimately did. In spite of its brevity, it is ultimately a smart, yet unpretentious book that resonated with me and made me want to read more. It is also a book I’d give to anyone who feels ostracized as a kind of feel-good reading, a novella that may actually provide solace. What more can you ask of a humble freshman offering? My final verdict will clock in at 5 stars +s eal of approval. You can get this fun, intriguing novella here on OBS! Prefer print? That can be found here on Dreamscarred Press’ homepage! Excellent review and especially found your views on fantasy fiction and RPG fiction very interesting. I know you are a busy many man and this request is a bit outside the scope of your Patreon, but might it be possible to you to list a few exemplars of each type. Thank you for posting! Indeed, I do believe that would be feasible. Will brainstorm that for the January!! Thanks Thilo! Wishing you and yours a wonderful holiday season!